Five Blackrock Further Education Institute students of Information Technology have recently returned from the beautiful city of Utrecht in the Netherlands having successfully completed a mandatory two week work experience placement as part of their QQI level 5 major award. Working with BFEI’s partner, ROC Midden, the students who are currently studying Games Design and Development, Computer Science and Web Design and Digital Media, were assigned to Success Media, a digital media company. During their placement Cian, Jack, Rajendr, Evan and Seán Óg were given an opportunity to practice and develop their web authoring and design skills. They also enjoyed developing their WordPress and search engine optimisation skills. And when work ended at 5pm each day, there was plenty of opportunities to explore the cultural and social aspects of this very vibrant city. Cian Cusack described it as the “best experience of my life” while Jack Landy reported that the “whole experience has given my confidence a huge boost”. Léargas, as the National Agency for supporting international exchange and collaboration, provided the funding to cover the cost of flights, accommodation, and day to day living expenses for all participants. The positive impact on the students has been considerable. They have thoroughly enjoyed the experience of living, learning and working abroad. They have had a unique opportunity to enhance their technical and professional skills thus enhancing their employability. Living away from home for the first time has greatly enhanced their self-confidence and independence. 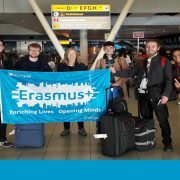 Evan Doyle wisely advised that “any student who gets the opportunity to participate in Erasmus+ should take it”! BFEI is still relatively new to Erasmus+ projects, having successfully completed their first student mobility project only last year. The plan for the future is to expand our involvement so students studying with us in all disciplines can have the opportunity to experience this unique learning experience.